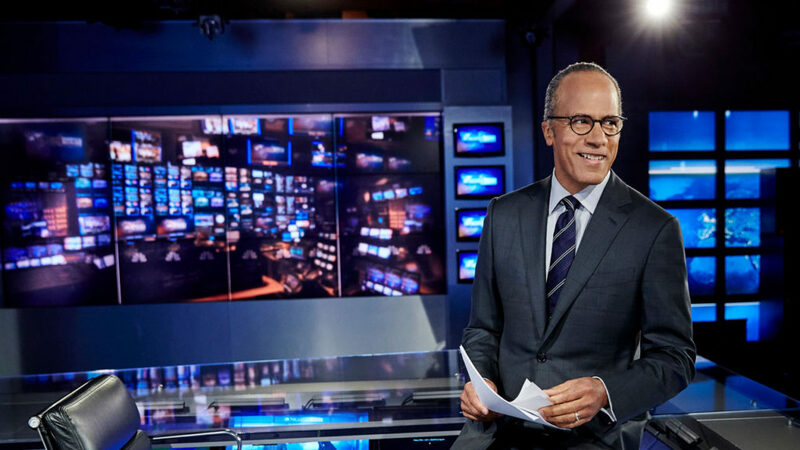 Lester Holt, anchor of “NBC Nightly News with Lester Holt” and “Dateline NBC,” will receive Quinnipiac University’s Fred Friendly First Amendment Award on Monday, June 19, in New York City. Photo courtesy of NBC News. Quinnipiac University will present its Fred Friendly First Amendment Award to Lester Holt, anchor of “NBC Nightly News with Lester Holt” and “Dateline NBC,” at an invitation-only luncheon at 11:45 a.m. on Monday, June 19, at the Metropolitan Club, One East 60th Street, New York. Quinnipiac presents the Fred Friendly First Amendment Award to honor those who have shown courage and forthrightness in preserving the rights set forth in the First Amendment. The award, which began in 1994, bears the name of the former CBS News president and champion of freedom of speech. Holt joined NBC News in 2000 and is known for his outstanding work in the field, reporting and anchoring from breaking news events across the world. In May 2017, he anchored “Nightly News” from Jerusalem during President Trump’s first international trip and reported from Manchester following the terrorist attack at a concert. In April 2017, he interviewed a senior North Korean defector and had rare access to U.S. military operations in South Korea. He has reported from Brussels and Paris on the terrorist attacks that took place across Europe in 2015 and 2016. Previously, Holt anchored from South Africa during the Nelson Mandela memorial service; reported from the streets of Cairo on the latest political and civil unrest in Egypt during the Arab Spring; covered the earthquake and nuclear crisis in Japan; and reported on the immediate aftermath and response to the devastating earthquake in Haiti. His field reporting often focuses on people most directly affected by the biggest stories of the day. In the week leading up to the presidential inauguration in January 2017, he traveled across the U.S. talking with Americans about the nation’s most pressing issues and their hopes for the next four years. Holt also hosted a roundtable of South Carolina voters before the 2016 primary, spoke with Baltimore residents following city-wide protests in April 2015, and had an exclusive talk with the witness who recorded the Walter Scott shooting. As a preeminent broadcast journalist, Holt was selected to moderate the first presidential debate of 2016, which was the most watched debate in American history. Holt’s one-on-one White House interview with President Trump in May 2017 drove headlines after the president said he asked former FBI head James Comey if he was under investigation. In January 2017, Holt traveled with President Obama on the Commander in Chief’s final trip aboard Air Force One, for an in-depth interview in Chicago. Earlier in the 2016 presidential race, Holt received praise for his work moderating the first Democratic debate of the year. He has also sat down for revealing, news-making interviews with candidates Hillary Clinton, Bernie Sanders, Ted Cruz, Marco Rubio and Jeb Bush. NBC News was the most watched news organization of Election 2016, with Holt anchoring all of the network’s primetime coverage through the Republican and Democratic conventions, debates and Election Night. For “Dateline NBC,” Holt has anchored numerous specials and investigative reports, such as “Breathless,” a story of injustice that examined the connection between childhood asthma and poverty in America. Holt also reported on wrongful convictions involving Richard Rosario and Johnny Hincapie, two cases that made national headlines. Additionally, he reported three hours on the aftermath of the Great Recession as part of the “American Now” documentary series. Previous recipients of the Fred Friendly First Amendment Award are: Dan Rather, Bill Moyers, Lesley Stahl, Ted Koppel, Tom Brokaw, Robert MacNeil, Jim Lehrer, Don Hewitt, Peter Jennings, Mike Wallace, Christiane Amanpour, Tom Bettag, Tim Russert, Bob Schieffer, Steve Kroft, Charles Gibson, Morley Safer, Gwen Ifill, David Fanning, Martha Raddatz, Scott Pelley, Richard Engel and Charlie Rose.